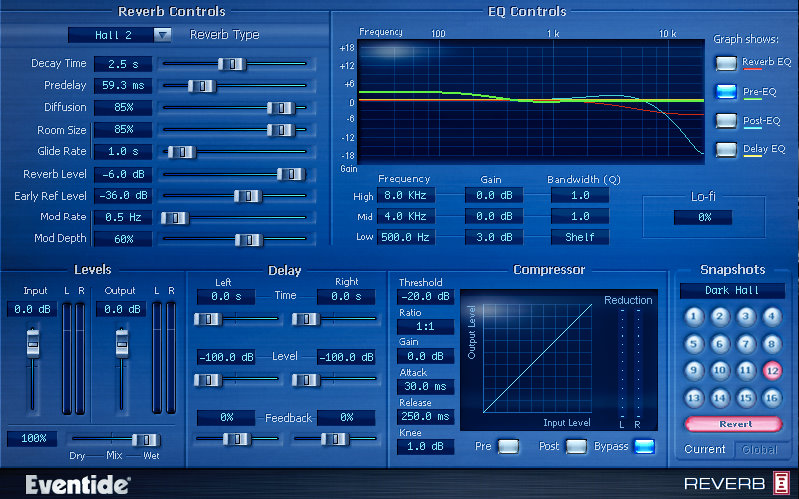 Derived from our H8000 studio processor, the Eventide Reverb TDM plug-in is a truly flexible reverb. Consists of Halls, Plates, Rooms, Chambers and Ambience. The Reverb algorithms are complemented by a pair of three band parametric EQ (one before and one after the reverberator), a compressor which can be placed eithe before or after the reverberator, twin delays, and a bit reducer. Eventide Reverb is also included in the Anthology and Anthology II TDM bundles. If you bought one of these products, please use the installers provided on their respective pages. For ProTools AAX support, please see UltraReverb. Eventide Reverb is compatible with TDM ProTools systems only on the following platforms.